So you know a thing or two about keywords and backlinks, and you feel like you can hold your own when it comes to SEO (search engine optimization). But then the term SEM comes up, and you’re confused by the question of SEM vs. SEO. Maybe you even think they’re the same thing? It’s true that both are valuable if you’re gunning for the top position in Google. It’s a noble goal to aim for – and a valuable one, as sites listed on the first page of a Google search have been shown to generate over 90% of all website traffic. But SEO and SEM are not the same thing, and knowing the difference is useful when using both of them to maximum effect. Keep reading to make sense of the two. Let’s start with SEM or search engine marketing. Once upon a time, search engine marketing was a term that fully encompassed SEO. These days, the two are related but not exactly the same. Note the importance of the word advertising. Essentially, you’re spending advertising dollars to boost your website’s visibility in search engines. It isn’t mutually exclusive from SEO – in fact, some of SEM is SEO – but not all SEO is SEM (say that five times fast). Basically, it’s giving you the ability for your page to be shown on the front page of search engines. Think of it this way. SEM is what gets your product or service to show up in the top paid areas of search engine when someone types in a key phrases, such as “red shoes”. Among the results that pop up will be ads for red shoes, and below the paid ads will be the organic SEO driven rankings. Then, there’s SEO or search engine optimization. If you’ve dipped your toes at all into the waters of digital marketing, you’ve probably encountered the term SEO (if not, time to get busy, because your marketing world is about to get so much more interesting). SEO, as it is currently defined, encompasses all non-paid technical and creative elements of growing your organic search traffic. In layman’s terms, it’s all about optimizing your website to get better search ratings. SEO is a twofold marketing strategy – it’s about making your site readable to both people and search engines, which don’t read a site the same way. You want a search engine to read your site well in order for a user to find you, which in turn improves your SEO metrics. Search engines are used by millions of people every day.SEO matters because it improves your ranking in SERPs – and 33% of web traffic goes to the top search result. SEO is also good for social promotion – people who find you through Google are more likely to share what they find. If nothing else, it’s to your benefit that many SEO practices are also practices that make a website run smoothly. SEO rankings are related to your relative user-friendliness, so it’s a win-win for everyone. 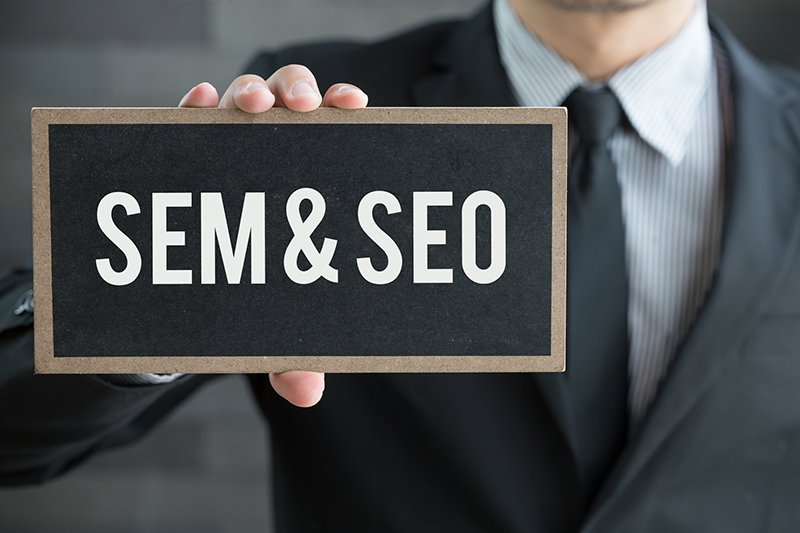 SEM vs. SEO: What’s the Difference? You could be forgiven for being confused since the term “search marketing” can be used as an umbrella to cover both SEM and SEO. But if you’re asking yourself about SEM vs. SEO, you might have noticed that the easiest way to remember the difference when you’re getting started is money. Don’t worry, it’s not as confusing as it sounds. To make a long story short, SEM involves paying to boost your ranking. SEO involves working on your site to gain rankings organically for free. Let’s break it down. The question of SEM vs. SEO has to do with what SEM and SEO respectively encompass. SEM is what you get when you see the ads at the top of your Google search results. SEO is what happens when you create high-quality content and optimize it to earn the top organic search result. Granted, the two complement each other. The amount of traffic you get is a boon to how Google ranks your website organically. Keep in mind that Google ranks paid traffic differently than organic traffic, but it’s still a plus. Now, the million dollar question: in the SEM vs. SEO fight, which one is more worth your marketing time? Think of it this way. 93% of online experiences begin with a search engine. That’s all online experiences. 93% of the whole lot. SEM and SEO are the one-two punch of how to get search engine crawlers to find your site. And without them, it’s not terribly likely that someone searching on a search engine will find you unless they’re looking for you specifically. And if you’re a brand new website with a following of ten (two of whom are your parents) you know that most people searching on a search engine won’t be looking for you specifically. Granted, there are situations where SEM makes more sense for you than SEO – especially if you’re just starting out. A paid ad, for example, will help you get immediate visibility to a brand new site. SEO tends to take longer, but from a cost-benefit perspective, it’s far cheaper than SEM. It’s also unwise to focus solely on SEM, even if it does produce immediate results in the beginning – search engines will reward you for a smart SEO strategy in the long run. When it comes to web traffic, nothing is quite as good as free, organic traffic, Good thing we’re your digital professionals. We offer professional SEO services and pay-per-click management services among our suite of digital marketing services. If you’ve got a project you’d like a quote for, fill out our request form. We can’t wait to get started.